Despite having a well-renowned slave system, the Principate Era saw many slaves, ex-slaves and freedman become well-known figures of their time. While the tales of Gladiators winning the favour of the crowds of the Flavian Amphitheatre are well-known in popular culture, the most common route for slaves to attain freedom was through diligent service to a master. Prominent ex-salves rose up either as masters of grammar and education or, alternatively, business. Many well-educated freedman were well-established tutors to the senatorial elites, able to spin off this patronage and become wealthy figures in their own right. Similarly, Roman landowners who were reluctant to involve themselves in the day to day running of their estates, often rewarded their slaves with freedom and allowed them to take responsibility for the muddy world of mercantile enterprise, transporting both goods and often slaves themselves around the growing empire. Such endeavour could earn the freedman an enormous fortune, even if that fortune was looked down upon by the established elites. After the 212 edict of Caracalla that gave freedman the same status as Roman citizens – principally to tax them – ex-slaves began to turn to art, religion and patronage in order to secure their new status. Julius was a slave who earned his freedom after a successful career as a grammarian. He worked as a tutor in Rome, teaching the children of Senators in preparation for public life. He was awarded his freedom in the reign of Caligula and settled in Iberia. In later life he amassed vast wealth and would eat up to ten meals a day. Tullius was a freedman and administrator from the second century AD. He hailed from Dacia and worked as a bureaucrat under Marcus Aurelius. He was freed by Commodus and later worked as an agent, securing antiquities for his wealthy patrons. In this career he modelled himself on Neuvus Bacilicus. Sextus was a notorious slave-trader from the first century. A freedman himself he moved slaves across land, often preying on areas of Germania and Dacia recently decimated by war. He made an immense fortune and died in a specially constructed villa. Sextus was a cruel and capricious man who would take babies from the arms of mothers so that they could be sold into slavery. Melissus was a shipbuilder and trader from the second century. He was born a slave but excelled at shipbuilding and was later awarded his freedom. Aulus Calidius Amotan was a freedman from the first century AD. He was born into slavery to a wealthy family in the eastern Mediterranean and he is thought to have taken the name Cif Amotan II after his manumission. He spent much of his life in Antioch and amassed a huge personal wealth, probably through his involvement in the maritime affairs of his ex-master. In later life, he chartered a great merchant ship and traded lapis lazuli from the Hindu Kush and cinnamon from Arabia Felix. He is thought to have died in a shipwreck. Saberius was a trader from the first and second century who made his fortune transporting goods from the east. He was a freedman and travelled as far as India, bringing back high value items such as, textiles, metals, ivory and jewels. He also traded slaves. Nona was a freedman from the second century AD, who was compared by his contemporaries to Trimalchio in light of his vulgarity and garish tastes. He hailed from Hispania and settled in the outskirts of Rome, before becoming a freedman he worked as a tutor of grammar. He died in 165 AD after he executed one of his slaves for burning food, and was subsequently set upon by his own slaves and killed in the kitchen with a red-hot poker. Laeus was a freedman from Gaul who made an immense fortune. He was born into slavery under a wealthy Senatorial family and by 200 AD was responsible for the shipment of all produce from the estates in Gaul. He was awarded his freedom but continued to transport goods across the central empire. He appeared in the east in 212 AD where he took the rights of a Roman citizen under the edict of Caracalla. He settled on the Dalmatian coast where he lived in a huge villa. He was notorious for the maltreatment of his own slaves. His son, Gallienatus, Mortanus Sevus became a priest of the cult of the sun god. Gaius was a freedman who obtained the rights of a full Roman citizen after the edict of Caracalla. He was a well renowned Grammarian and rose to prominence in Rome where he worked as tutor to many future senators. His school of grammar in Rome flourished in the third century. Decitanus was a freedman and slave trader from the second century. He took the rights of full citizenship in 212 AD, but continued to deal in slaves transporting those captured during Caracalla’s brief campaign in the east. Decitanus was a Christian. Tiberius Claudius Narcissus was a 1st century AD freedman who rose to a prominent position in the imperial court of Emperor Claudius. He gained influence within the court of Claudius and attained his freedom through that means. He was very loyal to the Emperor who entrusted him with great responsibility. He famously prevented a mutiny during preparations for the invasion of Britain when on seeing a former slave in the commander’s position, the troops cried “lo saturnalia” and returned to their posts. Later, as Agrippina was plotting to assassinate Claudius, Narcissus was sent away to Campania where he was told he could take advantage of the warm baths to relieve his gout. Within weeks of Claudius’s assassination, Agrippina ordered Narcissus’ imprisonment. Before being taken away Narcissus burned all Claudius’s papers to prevent the new emperor, Nero, using their contents for his advantage. He was later executed. 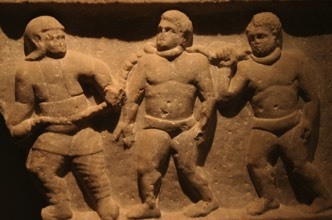 Conviva and Restitutus were successful brothers who earned their freedom. They are best known for owning the House of Vettii in Pompeii, which after the eruption of Vesuvius saw all of its frescos preserved. The Vettii brothers are emblematic of the changes going on in the sixth decade of the first century AD. Many of the older, elite families had moved out of the city after the first small eruption of the volcano in 62 AD and were replaced by members of the nouveau rich, predominantly wealthy freedmen eager for power and stature. The Vettii brothers were prime examples of this social mobility. They made their wealth as wine merchants and were soon able to purchase the elite status of freeborn aristocrats. The House of Vettii contains several graphic paintings and sculptures, which are held by some to suggest the decline in moral standards brought about by the new money that came to dominate Pompeii. Artworks in the house also testify to the multifarious role of woman as both sexual objects and symbols of fertility. The house also contains paintings with mythological images designed to support and emphasise the new social standing of the two brothers. Subjects for marble sculptures include Bacchus, satyrs and Paris carrying a lamb. The statues were connected to the water supply by lead piping so that they could spout actual water. Art historians have viewed the frescos at the House of Vettii as examples of the Pompeian Fourth Style. This complex figuration revives large-scale narrative painting with panoramic perspectives with whole walls would be taken up by framed pictures. The precise depiction of still life with intense space and light is not seen again in painting until the Dutch and English masters of the 17th and 18th Centuries. Aulus Kapreilius Timotheus was a slave trader who dealt in both captive and home-born slaves throughout the Mediterranean. At times he supplemented his trade in slaves with trade in other commodities. Tetraites was a gladiator who fought in the murmilliones style with sword, rectangular shield, helmet, arm guard and shin guards. He was first discovered through graffiti found in Pompeii in 1817, but evidence for his fame has subsequently been found as far away as France and England. Priscus and Verus were famous first century gladiatorial rivals whose fight formed the first battle to take place in the Coliseum. Their fight lasted for over two hours after which the gladiators conceded to each other by simultaneously laying down their swords. Both men were subsequently awarded a rudis by Emperor Titus out of respect for their performance. They left the amphitheatre as free men. Spiculus was a renowned gladiator from the first century AD. It is rumoured that he had a very close relationship with Emperor Nero who rewarded Spiculus’ many victories with palaces, slaves and riches. When Nero was overthrown in 68 AD he asked his aides to find Spiculus so that he could die at the hands of the famous gladiator. Sadly, for Nero, Spiculus could not be found and Nero was forced to take his own life. Marcus Attilius was a Roman citizen but he entered gladiator training in order to free himself from huge debts that he had incurred. In his first battle he defeated one of Emperor Nero’s own gladiators, Hilarus who had been undefeated in thirteen fights. Attilius also defeated the highly successful Raecius Felix. Carpophorus was a Bestiarus and fought against wild animals. Most Bestiarus had very short careers but in one of the inaugural battles at the Coliseum in Rome, Carpophorus defeated a bear, a lion and a leopard in a single fight. Later that same day he defeated a rhinoceros with only a spear and went on to defeat a total of twenty wild animals, earning himself comparisons to Hercules. Flamma was a Syrian slave who fought as a gladiator. He famously refused the rudis on four occasions, each time turning down his freedom in order to keep fighting. In total he fought 34 times, winning 21 times. 9 battled ended in a draw and he lost only 4 times. He died at the age of 30.